Alexa! It's been a while. I'll also be including a poll where you can vote to determine what one of the next bonus desktops will be! 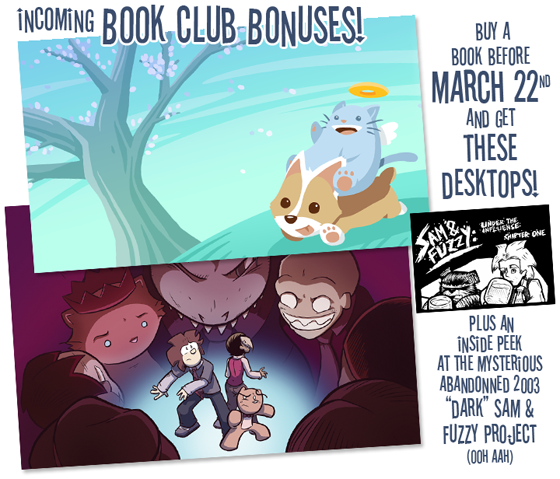 So Book Club members: email me your ideas for future bonus desktop you'd like me to make -- character pin-ups, parodies, scene recreations, super-deep continuity references, or whatever else you think would be cool. I'll pick my favourite suggestions and include them in the poll. Hey Book Club members! Do you have an idea for a future bonus desktop you'd like me to make? Email me your coolest desktop ideas... character pin-ups, parodies, scene recreations, super-deep continuity references... whatever concepts you want to see most! I'm going to pick my ten favourite ideas and put them in a poll that will be included with the next bonus pack. (Which mails out on March 23rd!) Whichever idea gets the most votes from your fellow Book Club members will be made into reality by me, and included in the next bonus pack. Woo! In the past, I've followed up each finished "big" arc with a new one that takes the comic in a different direction. But when this one is over, I think it'll be a finale worthy of ending on... at least as far as Sam and Fuzzy themselves are concerned. I have ideas for other stories in the Sam and Fuzzy universe that I'd like to pursue, though. (I've accumulated a pretty enormous supporting cast of characters to work with, after all.) And I've got a bunch of non-Sam and Fuzzy-related comics I'd like to work on, too! So even once the strip does end, there will still be plenty to look forward to. Promise! I guess I think of Conscience Cat as being male, but to be honest, his gender is so irrelevant to his character that it's really just an exercise in picking a pronoun to stick with! She has! The name is: Noosehead.